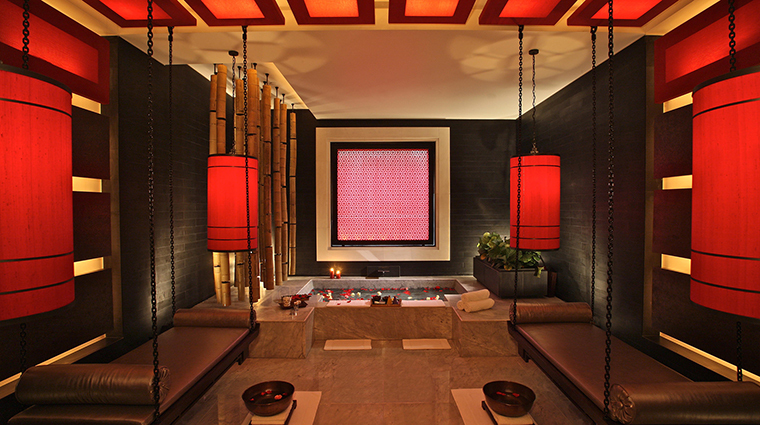 Sitting on the grounds of Four Seasons Hotel Hangzhou at West Lake, The Spa at Four Seasons Hotel Hangzhou at West Lake blends traditional Chinese and Balinese design. Dark wood combines with elements of feng shui, but there are also contemporary flourishes, like a neon pink light that glows through the wall next to a bathtub. Inside the rooms, it’s all dark wood and low lighting, but there are pops of color here and there, both from vases of fresh flowers and from the neon pink that backs the carved wooden privacy screens. 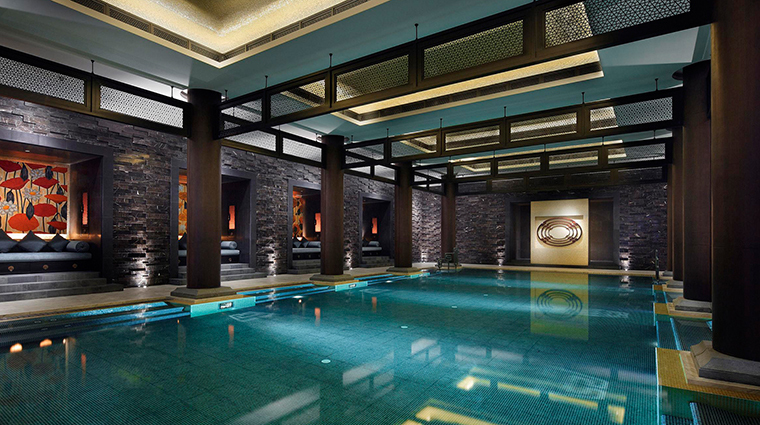 While the rest of the hotel is flooded with light, the lobby at the Hangzhou spa is quiet and darker. • You are invited to sit and relax before and after a treatment with a cup of seasonal tea (often locally harvested), fresh fruit and granola-like biscotti. • The seating in the lobby lounge is plush and inviting, and wouldn’t look out of place at a holiday house in Southeast Asia. 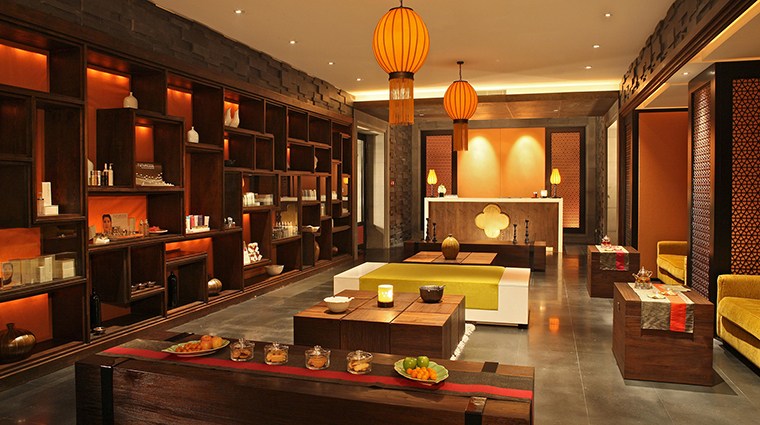 • All of the treatments at the Hangzhou spa were designed exclusively for the hotel. • One of the most indulgent services is the Dragon Well Tea and Jade Spring Ritual, which includes a soak in the essence of 60,000 tea leaves — the amount needed to produce two pounds of the longjing tea for which the West Lake area is famous. • The best way to get an appointment at this sanctuary is to call ahead of your stay. If you’d prefer to wait until you arrive at the hotel, we recommend going down and seeing which time slots are available. • To really take advantage of the lovely spa, arrive early and enjoy freshly brewed seasonal tea, fruit and granola-like biscuits. • While there are no specific couples treatments on the menu, most services can be done side by side in all of the spacious treatment rooms. The treatments that are best in tandem are massages and facials. • The eight massage options are available in 60- and 90-minute increments. • The Jet Lag Retreat is great for guests who’ve just stepped off a plane. You’re encouraged to deeply inhale eucalyptus while the massage therapist works to stimulate skin and circulation by applying some spinal pressure to help reset your body clock. • For spa-goers who want to relax after a long day of sightseeing, a reflexology massage will help you do just that — and prepare you for another day of pavement pounding. Reflexology is aimed at relieving tension and improving circulation, and Chinese traditional medicine devotees believe that when nerve endings are stimulated, blocked energy is released. 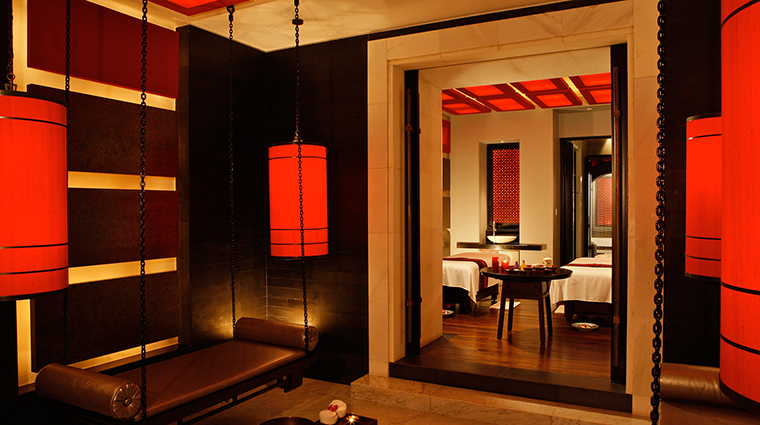 • The dimly lit treatment rooms take its design inspiration from ancient Chinese palaces. • Even entering the room is a grand experience, with the traditional round doors leading to a personal foyer in the elabortately designed rooms. 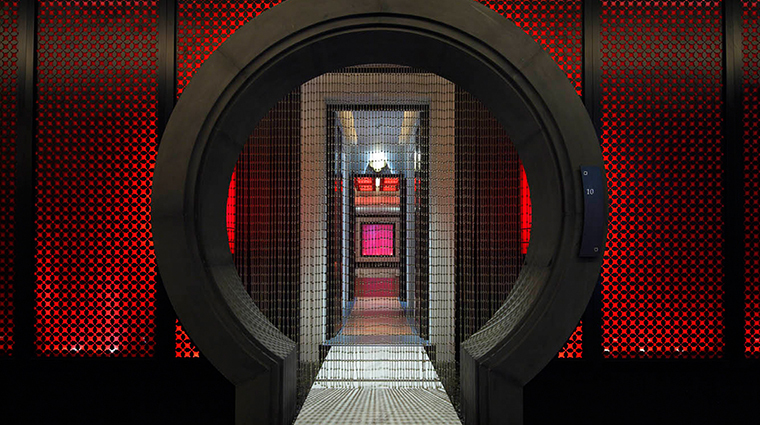 • Each of the nine treatment rooms can accommodate couples and has its own shower and steam room. Some also include sunken tubs.